In 1923, Edwin Hubble discovered the universe—or rather, he discovered a star, and humans learned that the Milky Way wasn’t the whole of the cosmos. Less than 100 years later, thanks to the telescope named after him, NASA scientists estimate the universe contains at least 100 billion galaxies, and who-knows-what beyond that. The exponential growth of astronomical data collected since Hubble’s time is absolutely staggering, and it developed in tandem with the revolutionary increase in computing power over an even shorter span, which enabled the birth and mutant growth of the internet. By 1973, the number of nodes had grown from U.C.L.A, the Stanford Research Institute, U.C. Santa Barbara, and the University of Utah to include locations all over the Midwest and East Coast, from Harvard to Case Western Reserve University to the Carnegie Mellon School of Computer Science in Pittsburgh, where David Newbury’s father worked (and still works). Among his father’s papers, Newbury found the map above from May of '73, showing what seemed like tremendous growth in only a few short years. 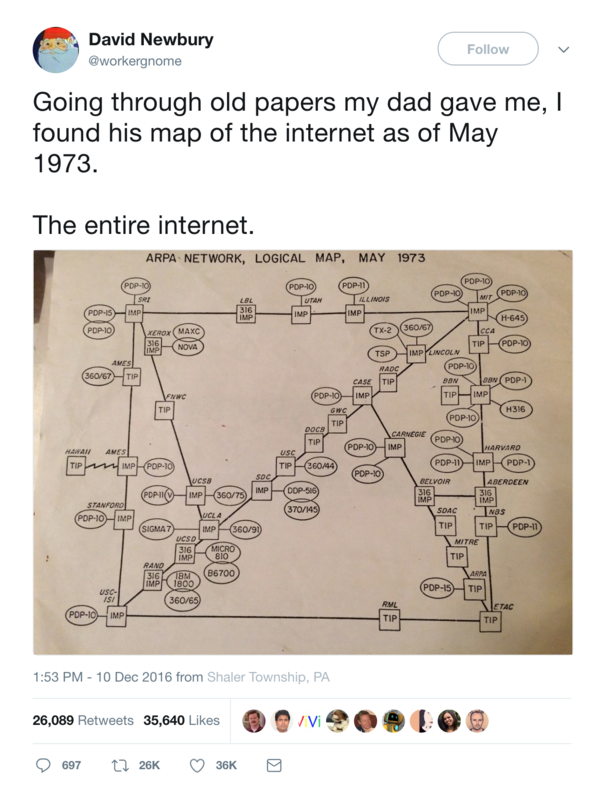 In the mid-70s, I was a graduate student in Computer Science at USC. I was often at the Information Sciences Institute in Marina del Rey, doing research in program verification. 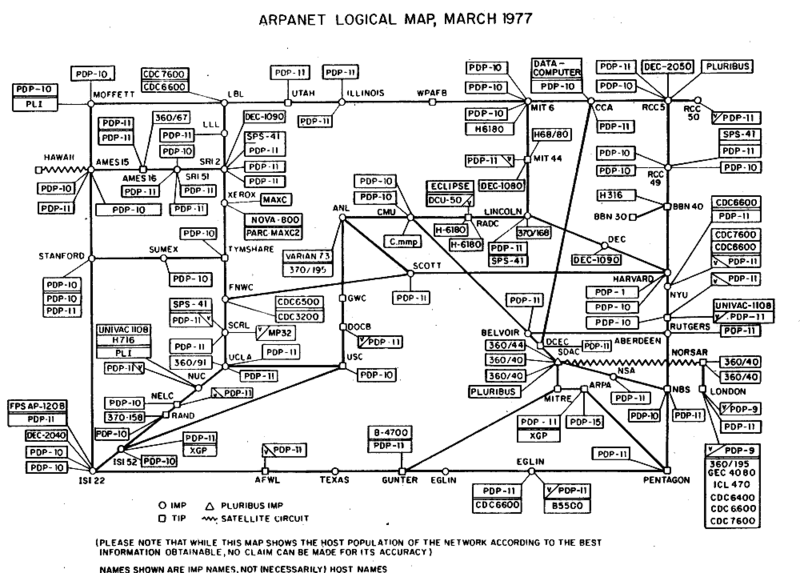 I remember being at an Arpanet terminal and logging into London and feeling “Wow! This is incredible.” This was at a quite fast 50 kb. In the early 80s, I worked at Northrop’s Research and Technology Center, and often logged in from home using a borrowed 1200 baud modem. Even at that speed, it was quite usable staying in Emacs for everything. Don’t get me started on punched cards and paper tape. This map, or one very much like it, appeared in a science fiction novel whose title and author I can’t remember at the moment. The main character was a rock star with psychic powers who could control computers. He faked a deep coma and was ‘stored’ in some research facility where brain waves were studied which gave him access to the internet. From there he could monitor everything and I vaguely recall that he destroyed all weapons systems. Haven’t read it in a long time. I’m pretty sure the word “star” was in the title but I can’t quite recall.